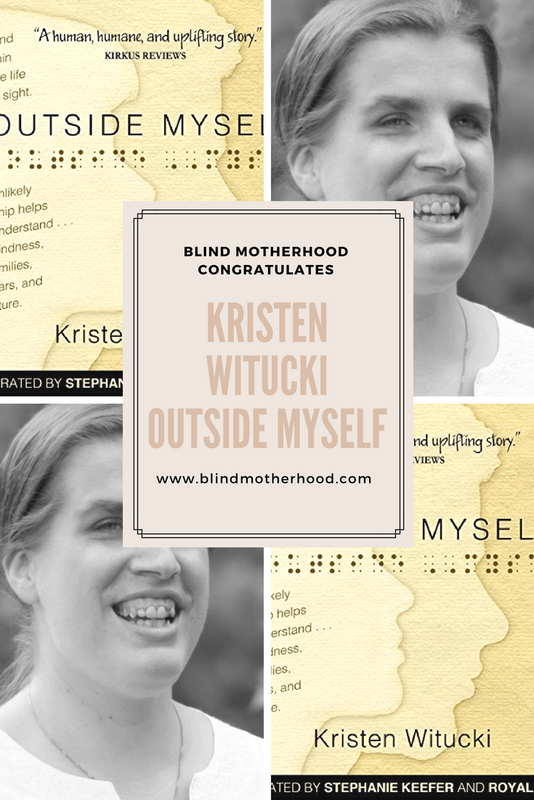 At Blind Motherhood, we like to celebrate the accomplishments of our contributors.This year, one of our own, Kristen Witucki, had her book published! OUTSIDE MYSELF is a young adult novel that focuses on Tallie, a teen girl struggling to adjust to her blindness, and Benjamin, an older gentleman who works in a library for the blind; each has a compelling story about negotiating the sighted world. Told from two perspectives, this book provides insight on life for blind individuals before and after the ADA. The National Federation of the Blind states that over seven million Americans have visual disabilities; this novel presents some of their unique experiences while bridging the reader to the feelings of isolation and interconnection of humanity without resorting to miracles or pity. Currently, there are a half-million print-disabled students reached by Learning Ally and Bookshare who will receive access to this novel. Author and Blind Motherhood contributor Kristen Witucki has been totally blind since birth. She earned a BA in English from Vassar College in 2004 with a minor in German and certification to teach students in grades 7-12. She followed it with three Masters degrees: an MA in teaching gifted students from Teachers College, Columbia University, (2006); an MFA in the creative writing of fiction from Sarah Lawrence College, (2008); and an Ed.M in teaching students who are blind or visually impaired from Dominican College, (2011). While in school, Witucki earned her living at Learning Ally, where she helped people with visual impairments, dyslexia, and other disabilities to access technology related to reading audio books. Kristen acted as a writer and editor for Learning Ally’s College Success Curriculum for students who are blind or have visual impairments. Learn more at kristenwitucki.com. Accessible editions will be made available to over 500,000 students with print disabilities through Learning Ally and Bookshare. ID: A 4 picture collage that contains 2 color photos of the book cover of OUTSIDE MYSELF and 2 black and white pictures of the author, Kristen Witucki, with her hair pulled back as she smiles. The links below will allow you to purchase Kristen’s book in various formats. For those who have Bookshare or Learning Ally memberships, you can also read it there. Kristen’s novel is also now available on Audible. Buying the book helps, of course, but there are other ways to help. Sharing its existence with your friends, families and colleagues can help the word to spread so that, even if it’s not the book for you, someone else may decide to give it a try. If you do read OUTSIDE MYSELF, remember to please review the book on various outlets. We are so proud of you Kristen! Congratulations from Blind Motherhood!